* ELEGANTLY 5 STAR! As seen in "25 BEAUTIFUL HOMES" -- FULLY AIR CONDITIONED with ROMANTIC OPEN FIREPLACE, truly a beach house for all seasons! Discover for yourself why TAMBAC is a PERENNIAL FAVOURITE, DONT MISS OUT ! Small PETS WELCOME. * Perched on the sand dunes with uninterrupted headland-to-headland ocean panorama, TAMBAC is a thoughtful mix of contemporary architecture and traditional balinese design. Features two pavilions with expansive, seamless indoor-outdoor living environment, including a private sundrenched tropical courtyard. Lavishly furnished lounge and gourmet kitchen, both spilling to a large deck. Each of the 3 bedrooms have their own bathroom. Includes digital TV, DVD & CD, home theatre system, free movies, gas BBQ, microwave, dishwasher, washing machine, dryer and lock-up garage. 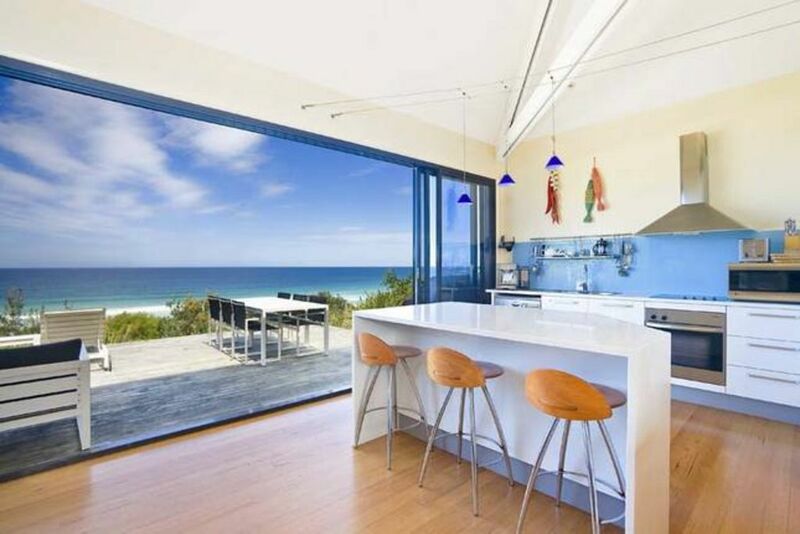 Truly a beach house for all seasons -- fully air-contitioned (cooling+heating). Enjoy cooking with the latest stainless steel appliances. You are welcomed with complimentary sparkling, light breakfast, freshly-ground coffee and nibblies. Colourful towels and crisp linen are all included! TAMBAC is part of YourUltimateBeachHouseExperience, a concept by Jose and Helen who are very passionate about hosting you only in the best waterside properties. TAMBAC takes its name from Helen's grandma's lovely 150-year old home by a riverfront. Locale - Boomerang Beach, Blueys Beach, Elizabeth & Shelleys Beach Located on Boomerang Beach at Pacific Palms, only 3.5 hours north of Sydney. Famous Blueys Beach and Elizabeth Beach and Seal Rocks are nearby. 15 minutes walk away hidden by bushland and large rock outcrops you will find Shelleys Beach where the daring may bathe au natural. Pacific Palms is a small intimate almost upmarket enclave locked in by Myall Lakes, Wallis Lakes, Booti Booti National Park, and the Pacific Ocean. Pacific Palms is famous for the things it does not have. A number of small shops are there to cater only to your basic needs. Beyond that you will need to drive to Forster 20 minutes away. As the locals will proudly tell you, they may now have broadband, but their village is still as sleepy as it was 20 years ago. Your Ultimate Beach House Experience North of Sydney This is the place to celebrate the essence of waterside living. The sound and proximity of the beach is immediately relaxing while the light, space and brightness and dazzling blue sky reflected on the ocean will captivate you and refresh your soul. By day there is the sun and the surf. Dolphins drop in virtually everyday. And of course the whales cruise by. At night lie down on the deck and gaze at the millions stars in their full glory with no town lights competing. From the Seal Rocks lighthouse a blade of light slices the dark evening sky with the regularity of a heartbeat. Or perhaps the moon is out and its glow reflected on the shimmering waves of the sea. And, oh, lastly, a few footnotes using the COMPLIMENTS OF OUR GUESTS:-----"We feel like movie stars, so gorgeous here!" -----"A very elegant frame to a beautiful view"-----"Just wonderful, we shall return"-----"This is our honeymoon, just put the icing on the cake by staying here"-----"The house is just stunning!" -----"Simply The Best!" -----"Incredibly relaxing in winter, we look forward to our next booking in spring"-----"Beautiful Beach, Beautiful more could you want...Wish It Was Ours"-----"This house is Magic!" -----"Thank you for giving us the opportunity to enjoy a piece of your paradise"
Tranquil beachside getaway a winner! The house and the setting are glorious, sounds of the ocean from the balcony and as you lay in bed at night. Would definitely recommend and plan to return. House layout, kitchen set up, bedrooms and bathrooms all clean, excellent quality and well fitted out. No horrible saggy mattresses or pillows here! Two minute walk to the beach. Very comfortable and very lovely. Appreciated the treat basket and drinks on arrival, a very classy touch. The only thing that would make it positively perfect would be wifi in the house. Not a big drama but it's no longer considered a luxury and this is a higher end rental. Having said that it certainly isn't a reason not to enjoy this stunning holiday home. Thank you so much for enabling our whole family, furry members included, to experience the serenity! We had an amazing time at Tambac. The location was amazing, and the views incredible. We saw dolphins every day. We have 2 small children so the layout wasn't probably the best for us as the master bedroom is within the main living area, and the 2 others outside, but we made it work. As you walk into this beachfront haven and see the view you know you've picked a winner!!! The view is amazing and the location is just as great! So close to all the surrounding beaches! We were welcomed with champaign and nibbles, a beautiful personal touch from the lovely welcoming owners of José and Helen! They made our stay!! They really keep the place immaculate at the same comfortable. Lovely homely touches with an elegant and sophisticated open living. Highly recommend and can't wait to come back!! Thanks for having us in your Beach House of TAMBAC! Wow what a place and what a view. Spent 3 nights here which went far too quickly. Great decor and fantastic deck for morning coffee and paper reading. We had a wonderful stay at Tambac - the location is simply stunning and the standard of accommodation is first class. It was a great place to enjoy with a few friends but also perfect for just ourselves and our little dog who was in heaven playing on the beach every day. We stayed at TAMBAC a few years ago with our daughter and in-laws and loved it. We would love to come again and enjoy the winter by the beach for a few days.